Gentlemen for Jupiter ritual oil works bring Jupiter’s graces into your life increasing your personal power, opening doors to new opportunities and increasing your assets. Sage and clean green notes balanced beautifully on a bed of earthy sandalwood and tonka beans. A seductive visit from The Green Fairy bestowing rich wormwood notes. Darkly masculine with well heeled leather and aromatic chicory. Each bottle has amethyst crystal fragments in it. It has been made and consecrated in my workshop using traditional methods. Ladies for Luna ritual oil works to help you establish the powers of your subconscious, working with cyclical events and harnessing your emotions. Road Opener ritual oil blend includes abre camino, ginger, lemon and a few other ingredients. It was made with a high quality carrier oil. Road Opener ritual oil works to remove obstacles in your life and open new paths for you. 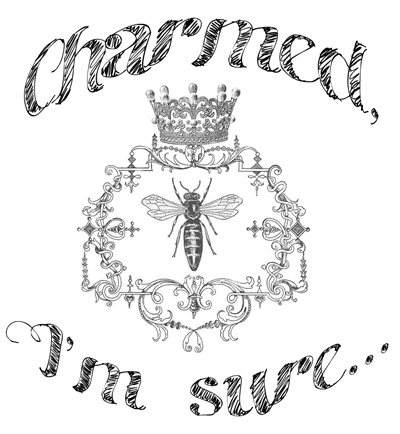 Charmed I’m Sure ritual oil works to make you perfectly charming to others. It’s been formulated to be a gentle glamour to make communicating with others go more smoothly. Voluptuous burgundy rose notes with fresh white floral nuances. Exquisite burgundy wine, and warmed by precious musk and apple wood. Redolent amber honey middle notes blended with sea weed, green ozone and salty sea breezes. 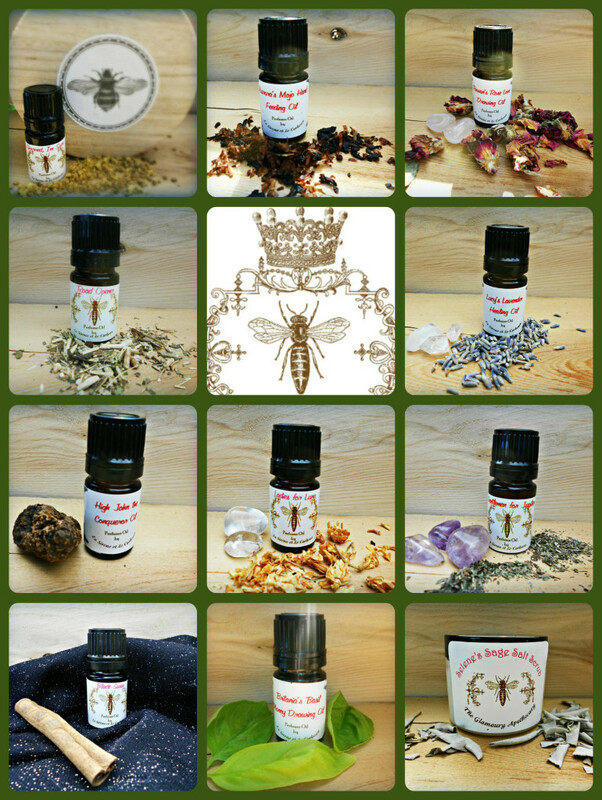 High John the Conqueror ritual oil is used for bringing success to your endeavors. It has been made and consecrated in my workshop using traditional methods. I use a mortar and pestle to cold press the herbs by hand and add the correct energies to the blend. Aurora’s Mojo Hand Feeding Oil uses a blend of dried herbs that include ginger and boneset this oil works to promote the prosperity, protection, attractiveness, luck and courage aspects of your mojo hand’s spirit as well as working as an offering to the spirit as well with tobacco and rum. I use a mortar and pestle to cold press the herbs by hand and add the correct energies to the blend. Britana’s Basil Money Drawing Oil uses a blend of dried herbs that include irish moss, honey, basil and cinnamon to promote drawing money and prosperity to you, this oil is made with a high quality carrier oil. Each oil comes in a 5ML glass amber bottle with a Euro dropper lid. For a visual reference, the bottles are the same size as the Black Phoenix Alchemy Lab bottles. It has been made and consecrated in my workshop using traditional methods. I use a mortar and pestle to cold press the herbs by hand and add the correct energies to the blend. While Basil is the predominant scent, other herbs like Cloves and Patchouli are used in the blend as well. Lucy’s Lavender Healing Oil uses a blend of dried herbs that include lavender and agrimony to promote healing for chronic conditions such as lupus, fibromyalgia, depression, insomnia and anxiety, this oil is made with a high quality carrier oil. Each oil comes in a 5ML glass amber bottle with a Euro dropper lid. For a visual reference, the bottles are the same size as the Black Phoenix Alchemy Lab bottles. It has been made and consecrated in my workshop using traditional methods. I use a mortar and pestle to cold press the herbs by hand and add the correct energies to the blend. While lavender is the prominent scent, other herbs like Life Everlasting and Coriander are used in the blend as well. Rowan’s Rose Love Drawing Oil uses a blend of dried herbs that include rose and damiana to promote drawing a potential partner to you and increasing your attractiveness to prospective partners or your current partner(s), this oil is made with a high quality carrier oil. Each oil comes in a 5ML glass amber bottle with a Euro dropper lid. For a visual reference, the bottles are the same size as the Black Phoenix Alchemy Lab bottles. It has been made and consecrated in my workshop using traditional methods. I use a mortar and pestle to cold press the herbs by hand and add the correct energies to the blend. While Rose is the prominent scent, other herbs like Jasmine and Ginger are used in the blend as well.